We’ve discussed at length how important is good, meaningful content to fare well in Google searches for plumbers. The blog on your website is a huge opportunity to publish regular content about plumbing repairs, which will allow you to optimize better for organic SEO, as well as keep your site updated and relevant. But it’s import as you hone the content marketing strategy for your plumbing business to think about what question or need you’re meeting with each post. This is called “User Intent,” and we’re going to dive into this topic to learn more about serving your potential customers with quality content that can’t help but perform well in the rankings! Over the years, the Google algorithm has increasingly favored useful content that will serve the user as precisely as possible. Black Hat SEO tactics are punished relentlessly in an effort to rid the SERPs of spam and help searchers find the best content on a given query as quickly as possible. There are so many factors that play into how a plumbing website ranks on Google, but one of the biggest to consider is content quality. Within the topic of quality content for your blog about plumbing services, a key factor to think about is user intent. Google is concerned with not only the relevance a given blog post has to the keywords used, but also the intent behind the keywords. For example, a user who begins a search with “How to…” is looking for very different search results than “Best [X] near me…” Taking into consideration what type of results the query is after will inform which webpages are returned in the SERPs. The content you publish on a blog — as well as your website and citation listings across the web, including social media marketing — will help inform search engines what your company is about, as well as your areas of expertise. This is why you should focus on what you know best, and to get really specific about the services and repairs you offer, and your service area too. After all, it won’t do you much good to kill it in the rankings for a post about frozen pipes under pier-and-beam homes if all the traffic is nowhere near you. Your service area is fixed — unless your fleet includes helicopters — so focusing on local user intent is necessary. In the example I gave above, we can see two different types of user intent for a Google search. There are several types that we need to understand so that we can better serve new plumbing customers as they try to find the repair services you offer. 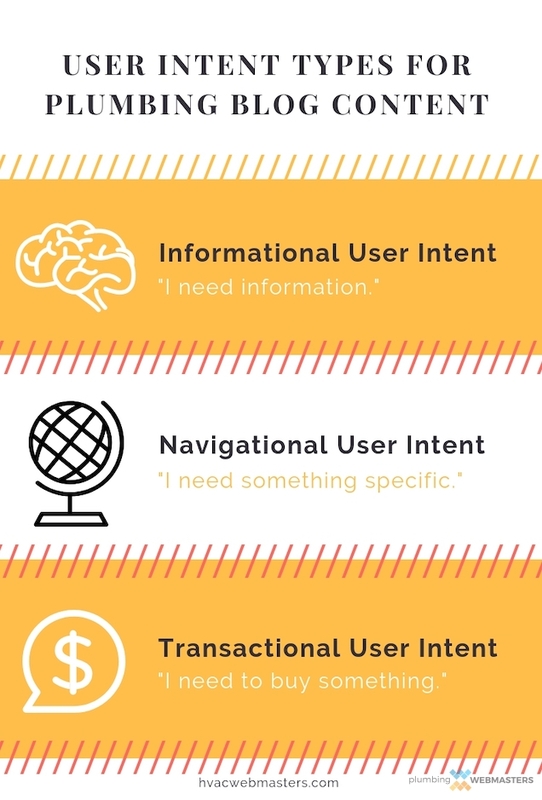 Because each of these user intent types represent various stages of the buying process, it’s prudent to appeal to each type to meet your potential clients wherever they fall. Whether a local resident is just starting to think about re-doing their plumbing or they’re ready to call a plumber for urgent repairs, each stage represents business on the table. So don’t pass it up! Do Your Blog Posts Answer These Search Queries Well? Well, OK, my examples are about light bulbs, and that’s not exactly what you’re trying to optimize for. But, it’s worth thinking about search queries relevant to plumbing, and asking yourself whether your blog posts respond to those needs. If they do, congrats! You’re off to a great start and should just continue to publish awesome content with strong on-page SEO. However, if your existing plumbing blogging is coming up short on this front, don’t delete what you have! Leave those up, revisit and optimize those older posts if you can, and move forward with intentionality to respond to each user intent type. Because you want to get specific in your posts, don’t try to cater to everyone in each post. But make the rounds, so to speak, and ensure there is information there for local folks who are on each end of the buying spectrum. I’m hoping that user intent and blog content already go together like peanut butter and jelly in your mind. Because so much of our focus (as a reflection of the Google preference) is on content that serves your audience, it should be a no-brainer to consider what the end goal is when someone happens upon your website or blog posts. Since we’re shining a spotlight on blogging specifically right now, let’s do a quick overview of some key ways that you can rock this aspect of your content marketing approach! With the shift in delivering useful information over sales pitches when it comes to content writing, it’s important to realize that we’re encouraged (to put it kindly) by Google to keep thinking about the user. Yes, you have to invoke some less-than-intuitive steps to help search engines better grasp what you’re doing in terms of SEO for plumbing, but it’s all with the goal of best representing your content to connect you to the viewer who needs that info. I mentioned it earlier, but you want to do everything possible to make sure that the people who find your website and blog posts are potential customers, or at least home and business owners looking for information about plumbing services that you provide. If you’ve gained a ton of traffic to a blog post about water line cleaning for espresso machines (because you offer water line cleaning and hope you can get a boost for that keyword phrase), but that’s not specifically something you do, you’re not serving your audience. The initial search may be to learn what is involved in hopes of a good ol’ DIY (“How do I clean the water lines in my espresso machine?”), but the results will likely inspire the novice handyman to call a professional. If your plumbing company doesn’t service coffee machines (and I’m guessing it doesn’t), then how valuable is your content to them? Not very. Matching keywords are great, but user intent is better. There is a lot of preoccupation these days with posts to not just perform well, but we want them to go viral. We want all the traffic, all the attention, and an overnight boom in our website hits. But here’s the thing: viral posts aren’t all they’re cracked up to be. They can necessitate a huge overhaul in your infrastructure to support the additional load, and if that’s not done quickly, it can straight up crash your site. How great do you think you’re going to fair long term if your site is constantly down or the load time of your pages are brutally long? Keep the focus on serving your local plumbing customers, and write blog posts that relate to user intent. Make sure the blog post titles and meta tags are focused on specific information and keywords relevant to what you do. Your phone will be more likely to ring when you show up high in the Google rankings for the services you offer to local clientele, versus trying to just see a webpage reach thousands of viewers with whom you will never form any kind of a relationship. Content marketing is absolutely about distributing information regarding plumbing without trying to sell, but at the end of the day, it’s part of the marketing strategy for your business. You have bills to pay, people whose livelihoods depend on you, and plenty of neighbors who want to services you offer. Write for them. Blog for them. And the calls will absolutely follow. This is the most organic way to meet user intent with your plumbing blog content, as well as your overall content on the web.